Manila: The land level of Metro Manila where there are 10 million residents, has been sinking while its sea level has been rising at a fast pace, an expert said, adding that reclamations and over-extraction of water have exacerbated the situation in the capital, an expert said. The sea level surrounding Metro Manila is rising by almost one centimetre per year because of global warming, Dr Fernando Siringan of the UP Marine Science Institute said during a Senate hearing, the data of which was reported by GMA News. The entire Metro Manila is sinking by several centimetres per year, estimated as one metre in four years, said Siringan, adding that in northern suburban Malabon, a fishing area compared to Venice, has been sinking by 10 centimetres a year. Some places that were never flooded before, have been experiencing floods, said Siringan, adding this is more noticeable in almost all places in Metro Manila. Scientists suggested that rivers must be widened, not just be de-silted or made deeper. But the Department of Public Works and Highways (DPWH) did not follow this suggestion for flood control, said Siringan. Instead, the government has continued with its reclamation projects on the coastal areas on the county’s eastern seaboard, to accommodate high-end infrastructure projects, said Siringan. Over-extraction of ground water has also contributed to the sinking of land level in Metro Manila, said Siringan. “These conditions should be considered by developers of infrastructure projects,” said Siringan. 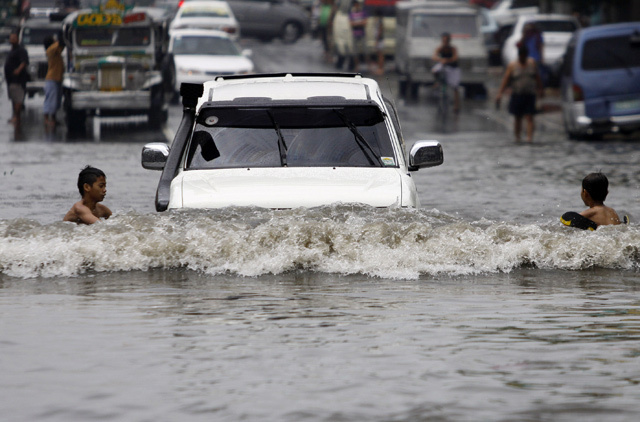 All these things should be taken into account in the government’s flood control project, Senator Loren Legarda said in the same hearing on climate change and climate risks in the Philippines. She also blamed the public works and highways department for insisting not to follow the suggestions of scientists in the government’s flood control projects. This has resulted in dreadful floods that devastated northern suburban Caloocan, Malabon, Navotas, and Valenzuela at the height of monsoon-triggered rains for 18 days that started late July, she said. About 21 typhoons damage the Philippines every year. The Philippines is part of Asia-Pacific’s Ring of Fire where earthquakes and volcanic eruptions also commonly occur.